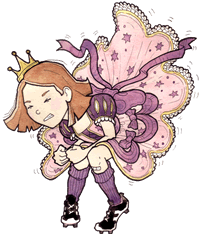 Princess Pumpalot (The Farting Princess) is a children's stage show based on the book of the same name by Robin Mitchell. The book was first published in July 2012 and has sold steadily ever since. The show premiered at The Assembly Rooms in 2013 and returned in 2014 at The New Town Theatre and 2015 at Sweet Venues. After such an enjoyable and successful run in 2015, we are returning to Sweet Venues for the 2016 Edinburgh Festival Fringe with a NEW show - Princess Pumpalot: The Radio Show — Live on Stage! Brand NEW show for 2016! She’s a Princess who farts. What more do you need to know? Can Princess Pumpalot and her best friend Guffy solve the mystery of the missing super-farting bean and save Wiffyville from the nasty Low-Flying Gnomes? Performed in the style of a radio play and based on characters from the top-selling book by Robin Mitchell, this fast paced, fun packed show is for all the family. WARNING: Audience participation is compulsory! Supported by Mandragora and Arcus Animation Studios.